Buyers will find a lot to love when choosing a 2017 Acura TLX in NH. Loaded with standard features that require expensive upgrades from its competitors, the TLX is without a doubt the most unique mid-size luxury sedan. But not in the traditional sense! The TLX stands out by not trying to out-do the competition through performance, but by creating a simple, yet elegant driving experience that anyone can enjoy. With enough power to keep performance lover’s happy, and the comfort and smooth driving dynamics to be an everyday car, the TLX creates a great balance between non-luxury and luxury sedans. Getting a 2017 TLX from a Acura dealer in NH is one of the best decisions you can make as a luxury car dealer, and Sunnyside Acura is here to show you why. 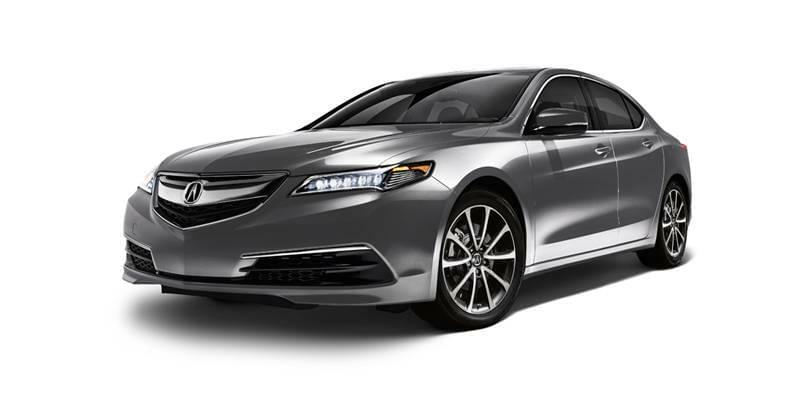 So if you’re looking for a new TLX, click the button below to browse our incredible inventory, or keep reading to learn more about why you should consider the TLX! Compared to its luxury car competitors, the TLX is full of amazing features that require upgrades from other brands, such as Jewel Eye LED headlights and a multi-view rear camera. The cabin of the TLX is sealed off to provide drivers with limited exposure to outside noise, giving you the ability to immerse yourself in music, or simply better enjoy the driving experience. Both engine options on the TLX provide buyers with performance and fuel economy that either rivals or beats most of its competition in the luxury mid-size sedan class! We appreciate your interest in our inventory, and apologize we do not have model details displaying on the website at this time. Please fill the form out below and our team will quickly respond, or, please call us at (603) 880-6550 for more information. When car enthusiasts think of a driver’s car, they imagine a car that balances high performance, great driving dynamics, and only features a manual transmission. And while these types of cars are great for enthusiasts, the majority of car buyers aren’t interested in feeling like a race car driver during their daily commute in NH traffic, or while making a quick trip to the grocery store. But that same majority doesn’t want a boring car–they just want something different. A car that combines good driving dynamics with comfort and reliability. This is how buyers and reviewers have described the Acura TLX. It doesn’t try to beat brands like BMW and Mercedes-Benz at their own game; instead, Acura is creating completely new types of driver’s cars for the masses. The TLX comes standard with a modest 2.4-liter 4-cylinder engine that creates 206 hp, which puts it on par with many other entry-to-mid level luxury sedans, such as the Lexus IS, BMW 3-series, and Mercedes-Benz C300. The difference, though, is upgrading to V6 in the TLX is much more affordable compared to these other brands. What separates the TLX from the competition in performance has to do with the feeling it provides. It’s not as engaging as others, but it also doesn’t try to be. The TLX is the car for a driver who wants the extra performance you get from a high-end car, but doesn’t want to drive an actual performance car. Because the TLX shines by providing drivers with a smooth, quiet driving experience. 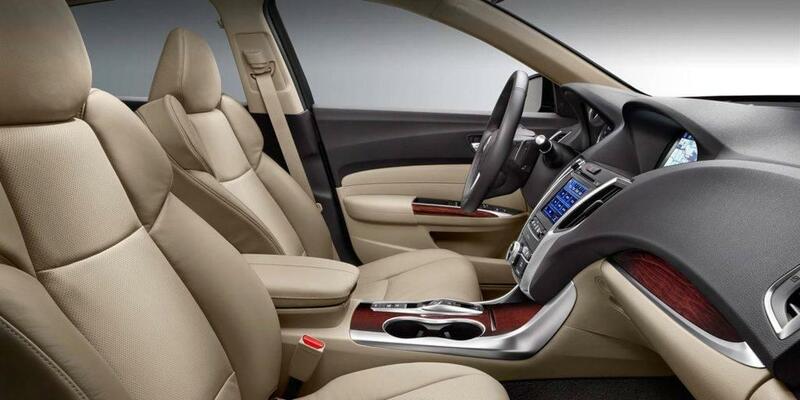 Acura went above and beyond to create a quiet cabin for drivers that want peace while driving. You won’t have to turn your audio system’s volume all the way up to consistently enjoy your favorite music or audio book. In other cars that focus more on engaging the driver and creating loud exhaust notes, you’re going to have a completely different driving experience. Speaking of performance, you can choose your own path with the TLX. At one end of the spectrum, Acura offers a standard 2.4-liter 4-cylinder engine generating 206 hp (2016 model year). On the other, you can choose a 2017 TLX with the 3.5-liter V6 engine that creates 290 hp. If all you’re after is a little extra performance compared to a non-luxury sedan, the TLX’s standard engine will suit you just fine. But if you’re really looking for performance power, there are plenty of TLX models in our New Hampshire inventory with the V6 option available. Both options will suit different types of drivers, as the TLX with the 4-cylinder engine has one of the highest fuel economy ratings in its class. 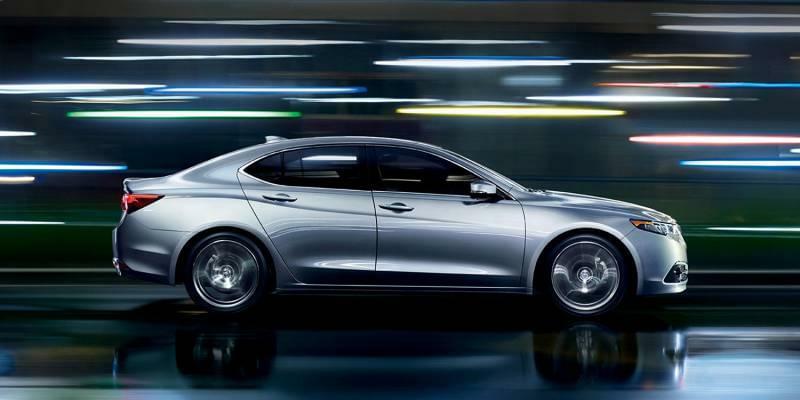 Meanwhile, the TLX with the V6 is one of the most powerful options in the mid-size luxury car class. With the 4-cylinder engine, the TLX’s fuel economy on par with non-luxury competitors with lower performing engine options! And despite the power upgrade with the V6, the TLX still manages to achieve excellent fuel economy, making it a great option for everyday drivers. If you’re on the fence about which model to go with for your new TLX, we recommend test driving both and see if you feel the price difference is worth the performance upgrade, or if you’re more interested in the extra fuel economy. Acura has had a ton of success in the Pirelli World Challenge with its racecar, the Acura TLX GT. With a design inspired by the production TLX, the GT car is tuned for perfect performance with over 500 hp and weighing just over 3000 pounds. And while it would be incredible if Acura could release this car to the public, it probably wouldn’t make for the most practical commuter car. Instead, Acura is compromising and releasing a unique package exclusively on the TLX to honor the achievements of the TLX GT car. This TLX GT Package is not going to blow any minds, or add any real performance to your new luxury car, but it does offer some serious appearance improvements to give your car a more race-inspired look and feel. Acura does this by adding a rear decklid spoiler, and underbody spoilers throughout the entire vehicle to give it the low-to-the-ground appearance you’ll find in a typical GT racecar. You can tie this all together by adding the Wheel and Tire Kit, which adds 19-inch Diamond cut wheels and tires. These incredible wheels add even more appeal to the TLX’s looks. Overall, it’s a great package to affordably add more aesthetics to the TLX, but if you want the performance of an actual racecar, you might want to look into the NSX! Choosing a 2017 Acura TLX in NH is not a risky, bold decision that typically comes with luxury car buying. Instead, it’s seen as calculated move that will ensure you get a reliable luxury vehicle for a great price.Acura has made it extremely easy for car buyers to have their cake and eat it too. No more choosing the affordability of a non-luxury car over the perks and features of a luxury car. 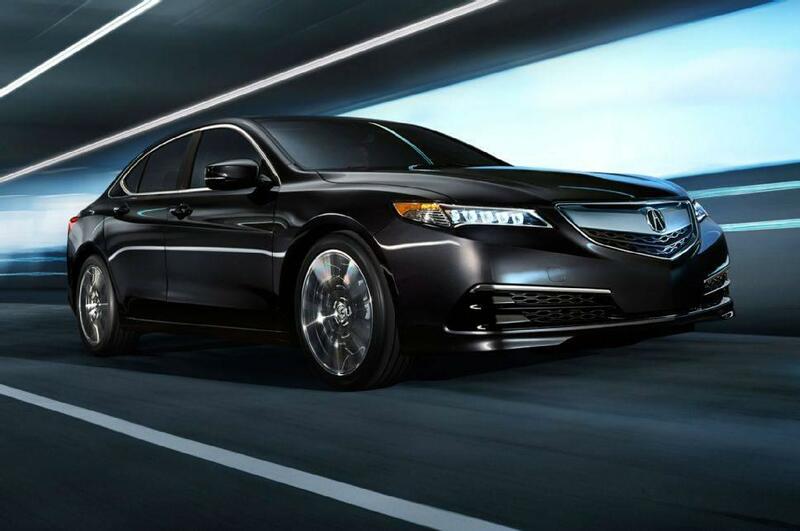 By choosing the Acura TLX, you’ll not only save money on your next car, but you’ll be in a car worth showing off to friends and family!To start your world-class car buying experience, browse Sunnyside’s inventory online and find a new TLX that fits your needs. For personalized help, feel free to contact us, or just stop by our convenient location at 482 Amherst Street in Nashua, just up the road from Nashua Community College. We look forward to earning your business!